Oud Sluis is hardly in the Netherlands. To get there from Brussels you take an hour train ride to Brugges, and then it's a 20 minute taxi rile taxi to the restaurant. In a part of the Netherlands called Zeeland, it is so near Belgium that the road sort of zig zags between the two countries. The restaurant sits in a quaint square in what can only be described as a cute Dutch town, giving the appearance of a world class restaurant as soon as you walk in the door. The restaurant is a small affair, something like 30-35 seats between two dining rooms. We were seated in the larger of the two rooms, which was full, but the smaller room sat empty for lunch that day. They handed us the menus and they started to explain how the meal worked. I cut the captain off and I asked for an audience with the chef, Sergio Hermann. The captain told me that he doesn't like to come into the dining room, but I was welcome to go see him in the kitchen. I picked myself up and walked over to the kitchen where I took him by surprise. He looked up at me and I reached out to shake his hand and said, "J.P. Perez told me to say hello for him". Hermann looked at me for a second or two to size me up, then he smiled and said "How do you know J.P.?" I went on to tell them that J.P. and I had a six hour lunch at Hof Van Cleve a day earlier. He laughed and we agreed to chat after the meal. Sure enough, a few minutes later our captain appeared and said "you have mentioned a very famous name in this region and Chef Hermann would like to prepare a special tasting menu for you." Well I don't mind if I do, thank you very much. They started us off with a showering of amuse. First a sorbet of wasabi, sake, lemon and lemon zest. then chopped razer clams. 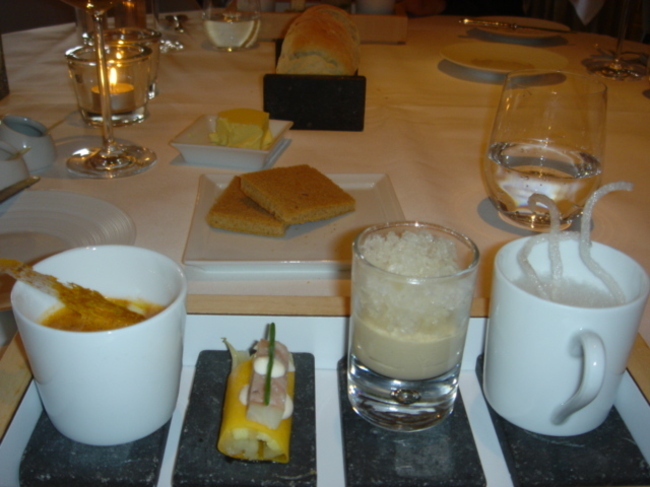 That was followed by a flight of four amuse served together- crevette gris (the local gray shrimp) mixed with potato mouseline, tomato and lobster wrapped in mango, a muscadet granita served with a goose liver mousse and a soy soup with rice noodles, fish and vegetables. Then bluefin tuna served with Japanese lemon on a soy and tofu base (sorry for the fuzzy picture on this one). It was quite an introduction to Hermann's cuisine and in other restaurants these could have been proper courses. Savoury courses started with a langoustine tartar topped with a disk of frozen ouzo and served with an olive oil gelee, avocado cream sauce and garnished with a type of seaweed that is indiginous to the region. It was a great start. Not only was it delicious, this is exactly the type of modern-styled cuisine I am interested in eating. Then a very grilled langoustine with heirloom garlic, eggplant cream and lime foam that was reminiscent of Adria's langoustine service (but this was tastier if you ask me). Then a service of oysters - first a playful liqiuid nitrogen oyster shot served in a paper cone which didn't make much of an impression. That was followed by an oyster sunday with yogurt cream, rose champagne granita, iced diced cucumbers and caviar. Delicious flavors that were well thought out but I the oysters were sitting at the bottom of the glass and I didn't feel they were perfectly integrated into the dish. Our flight of oysters ended with the best dish of the day. A poached oyster in a mousseline of creamed Jerusalem artichoke with clorophyll and a quinoa biscuit. The quality of the oyster (which we were told is raisied locally and comes from the Scaldes) was superb, perfectly cooked, and the creaminess of the sauce and the firm and meaty texture of the oyster made for a profound combination. A masterpiece of a cooked oyster dish that I'd be happy to go back and eat it again tomorrow. Then another mini-masterpiece. Smoked lobster served atop slow-cooked pork belly that was marinated in a Chinese style served with black bean soy butter sauce, pumpkin cream and thin slized pumpkin discs. A superb combination of meat and fish, once again I was reminded me of El Bulli and a dish of Chinese pork fat I was served at the restaurant. Then a delicious tranch of local turbot with shrimp toast crumbs, served with a salad of king crab with cream of artichoke, and a tempura of soft shell crab and lime followed. Our last savoury course was a low temperature cooked pigeon served in a pigeon reduction, with cream of parsley root and cannelonis of parsely root stuffed with pigeon leg and savoy cabbage canneloni stuffed with goose liver. Shades of Mugaritz or Can Roca in the Netherlands - this was the modern style cooking at its best and a superb way to end our meal. Desserts were good as well with a chocolate grenache bomb, a spun sugar macadamia nut biscuit with jelly of walnut oil, oat milk, and coffee caramel and peanut ice cream ( one person at the table described it as a high class Snickers Bar), finished up by a granita of champage with lychee, and lime ice cream and passion fruit. I'm not a huge dessert fan but these were refreshing and not overwrought as some dessert courses can be. We drank pretty well too. A 2003 Raveneau Chablis Clos and a 2001 Chave Hermitage were both delicious. I am such a big fan of "razor clams". You don't see them that often on menus in America. Pity. I liked the grilled langoustine course as well. I like lanogoustines but more to the point I like to grill them and also lobster. Another interesting posting! Thanks. Steve, you make a fine point re: adaption to native cuisine. It's somewhat strange actually - by referencing the familiar, they can more easily bridge an audience to their experiments. Steve -- I'm a little confused about your grading system. How does Peter Luger's get an 'A', and this place and Kuruma Zushi get 'A-'s, while Esca gets a 'C'? The experience you had at this place, where you had a personal connection with a VIP which resulted in the chef "pulling out all the stops," strikes me as an 'A'. According to the rating system I use on this site, ratings are specific to their categories. For example, I think readers are capable of figuring out that because a pizzeria might get an A, that doesn't mean the food is the same quality as what you can get at a haute cuisine establishment. So when Karuma gets an A-, it considers the overall quality they serve, and the relative quality compared to Yasuda which I prefer because of the rice. Must say that really looks great. Something is going on in terms of fine dining in the Netherlands/Benelux, this is clear. Did not go to this one but several experiences in The Hague area convinced. I am not sure, however, that this makes the region a centre of innovation. Rather a place that suddenly invest fine dining. Which is great. What do you recognise as modern techniques? Are they liquid nitrogen, low temp cooking, sousvide? Does it include the use of the chantilly maker for other purpose such as virtual bacon? Is Veyrat an innovator. Now the question that really puzzles me: how do you eat that langoustine? Do you leak its carapace to get that nice foam on top and then peel it with your fingers? Do you eat the whole thing like a seagult would do? This is the kind of dish in front of which I would feel embarassed. Also, I would have liked to know what they had to say about "how the meal works". Thanks for this great review on Oud Sluis te Sluis. It is indeed a great table. I have the highest respect for Chef Sergio Herman: he does exactly what I from any great cook: constantly updating himself with the latest trends, techniques. Here in Montreal, Canada: we miss just this little step forward -> Chefs who commit to stepping into those daring extra steps like Cher Herman does. Thanks for the information! Steve, you make a fine point re: adaption to native cuisine. It's somewhat strange actually - by referencing the familiar, they can more easily bridge an audience to their experiments.